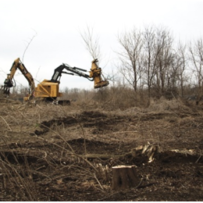 Project involved clearing the 35+ acre site of all trees prior to the return of a protected bird species to prevent destruction of active nesting. Work required as preliminary step to landfill cap work. We provided pre-award services to assist with finalize design, preparation of contract documents, evaluate proposals, assist with award and management of the construction work.